The Holy of Holies (Hebrew: קֹדֶשׁ הַקֳּדָשִׁים, Qṓḏeš HaqQŏḏāšîm) refers to the most sacred area of the Tabernacle and later also of the Temple in Jerusalem. This sanctuary was called the Holy of Holies, or Most Holy Place. It was the inner part of the Tabernacle. 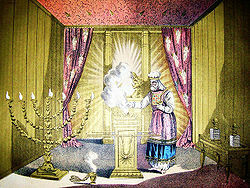 There, during the First Temple, the Ark of the Covenant was kept. In this place, only the High Priest could enter and only on the day of Yom Kippur, to offer incense in the ritual of atonement (כפּרה, kaparah). There was a partition of cedar wood between the Holy Place and the most Holy Place. ↑ 1.0 1.1 Unterman, Alan (1997). Dictionary of Jewish Lore & Legend. Thames and Hudson. ISBN 978-0500279847. ↑ Douglas, J.D. ; Tenney, Merril C, ed. (1987). The New International Dictionary of the Bible. Grand Rapids, Michigan: Zondervan Publishing House. p. 980. ISBN 0-310-33190-0. ↑ Unger, Merrill F (1988). Harrison, R. K.. ed. The New Unger´s Bible Dictionary. Chicago: Moody Press. pp. 1259. ISBN 0-8024-9037-9. This page was last modified on 21 November 2013, at 18:32.